​More Than Talk: A Covenantal Approach to Everyday Communication 5e is designed as an introduction to communication from a Christian perspective. Professors have used it as the sole text in introductory courses and as supplemental reading in advanced and graduate level curricula. Thematic chapters with updated research on common communication contexts. New “What Do You Think?” boxes that address popular trends such as social media and diversity. Student-friendly pedagogical features such as the new study app. Excellent instructor features, including questions for discussion and assignment suggestions. More Than Talk continues to develop the biblical idea of covenant for understanding and appreciating student communication. 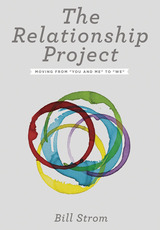 ​The Relationship Project: 'Moving From You' and 'Me' to 'We' is written to challenge current thinking that communication is the holy grail of great relating. We understand communication is important, but realize that ill-intentioned people can use excellent skills to manipulate others to get what they want. We suggest that redeeming relationships begin with redeemed people, and that we start with the soul project of looking at our own moral make up. This book provide resources to consider how self control, humility, hard work, committed faithfulness and wisdom contribute to close covenantal relationships of all sorts (friends, family, marriage and professional). Using a warm, accessible writing style, Professor Strom introduces readers to the importance of personal virtues in building long-lasting, satisfying covenant relationships. Each chapter skillfully blends the latest research findings with stories and reflection exercises. Highly recommended for those who want to strengthen their friendships and marriages. Wedding virtue and research on relationships, Bill Strom’s new book seeks a wisdom which pursues holiness and counters the prevailing messages of self-fulfillment and pleasure that infuse so much popular relationship advice. Kudos to him for bringing fresh insights to this important dimension of our lives. I am constantly on the lookout for books to enrich my marriage, family, and friend relationships.The Relationship Project handsomely delivers. Reading easily and enjoyably, it brims with insights and examples. What a magnificent resource for small groups, marriage preparation and counseling, mentoring relationships, and sermon enrichment!